I have tabulated values for $B(T)$ and $C(T)$. I know $P$ and $T$ and want to solve for $\rho$. The equation is cubic in $\rho$ meaning I could potentially have three real solutions. I suspect that since the virial equation is intended to calculate the densities of vapors or supercritical gasses at relatively low pressures, that the lowest real root is the "real world" value. Is this correct? Do the other real values, if they exist, have any meaning? Can this be generalized to higher order virial expansions? My recommendations would be to identify the correct root based on physical knowledge of the system: first, the root has to be real and its value of $\rho$ has to be positive. This part is obvious. The second thing we know is that the virial equation represents a deviation from the ideal gas law. So, I would take the root that is closest to ideal behavior. At least in these conditions, this rule works. The virial equation is set up for the gas phase only. The virial coefficients $B$ and $C$ are found from gas phase measurements. If you get three solutions, I suspect that it is the largest one that you want. I'd do a trial solution with something like water vapor to see. Higher order virial equations are problematic since it is exceptionally difficult to determine higher virial coefficients from experimental data. 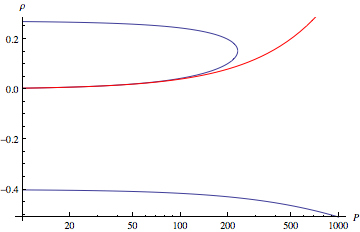 Higher order virial equations do have theoretical interest, but that's another story. Not the answer you're looking for? Browse other questions tagged equation-of-state or ask your own question.